The U.S. military has historically relied on its capacity for technological innovation to respond to new risks and crises. But, as Sharon Burke explains in this week’s podcast, the Pentagon has had to invent a new role for itself in response to a changing world. 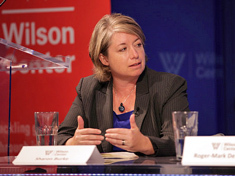 Burke, who served as the first assistant secretary of defense for operational energy from 2010 to May 2014 and is now with the New America Foundation, explains that when she started working at the Pentagon 20 years ago, oil prices were low and she struggled to find space to pursue energy security. As the threats of the Cold War faded, however, the mission and role of defense agencies quickly became more complex and understandings of national security shifted. The Department of Defense now considers longer-term trends that can lead to instability and situations where they might be called on to respond – “systemic-level influences, where it’s gender and demographics and resources and military security all coming together,” she says. Environmental change is among these global trends. The military’s signature strategy document, the Quadrennial Defense Review, incorporates climate change, energy security, and water, and the latest National Intelligence Strategy, released last week, includes a section on natural resources and frames climate change as a “threat multiplier.” The Department of Defense has also started to prioritize internal energy security. Burke’s former office, which she helped create, works to reduce costs and risks by managing energy use. As the forces shaping national security become more complex, so do the choices facing the military. For example, although alleviating poverty is not a military responsibility, says Burke, reconstruction teams in Afghanistan and Iraq had to confront poverty to try to stabilize the areas they worked in. For Burke, finding the right answers also depends on a more dynamic political system. She says she worries about a “brittle, inflexible, and rigid political system” that’s not adapting to major changes on the world stage, like climate change and demographic shifts. These attributes are critical not only to protecting the United States, but also to maintaining its leadership role in the world. Burke spoke at the Wilson Center on September 18.